The game had a very big importance for second-ranked Al Fateh as it allowed them to take a leadership position. 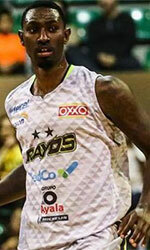 Al Fateh defeated 6th ranked Al Hilal in Al Hasa 83-71. Al Fateh (12-1) have an impressive series of twelve victories in a row. As mentioned above they are at the top of the standings, which they share with Uhud. Al Hilal lost third consecutive game. They keep the sixth place with six games lost. Al Hilal will play next round against Al Salam trying to get back on the winning streak. Al Fateh will try to continue on its current victory against tenth ranked Al Nahda in Al Khobar. Another exciting game was a derby match between two teams from Medina: Uhud (#2) and Al Ansar (#8). Uhud (12-1) crushed visiting Al Ansar (3-10) by 20 points 101-81. The victory was the fourth consecutive win for Uhud. Defending champion keeps a position of league leader, which they share with Al Fateh. Al Ansar lost their fifth game in a row. They keep the eighth place with ten games lost. They share the position with Al Salam. Uhud will play against Al Ittihad (#5) in Jeddah in the next round. Al Ansar will play on the road against Al Ahli Jeddah and hopes to get back on the winning track. Bottom-ranked Al Nahda (0-13) tried to put together a comeback for its first victory of the season, but they fell short in the 112-55 loss to fourth ranked Al Nasr (8-5) in Riyadh on Sunday evening. Al Nasr moved-up to third place, which they share with Al Ahli Jeddah and Al Ittihad. Al Nahda lost their tenth game in a row. Newly promoted team still closes the standings with 13 games lost. Al Nasr will meet Al Wehda (#7) in the next round. Al Nahda will play against the league's leader Al Fateh and hopes to get finally their first victory. The game in Al-Awamiyah supposed to be also worth to mention about. 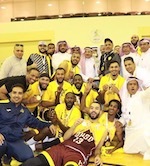 Fifth ranked Al Ahli Jeddah (8-5) played at the court of 8th ranked Al Salam (3-10). Al Ahli Jeddah smashed Al Salam 89-63. Al Ahli Jeddah moved-up to third place, which they share with Al Ittihad and Al Nasr. Newly promoted Al Salam keeps the eighth position with ten games lost. Al Ahli Jeddah's next round opponent will be Al Ansar (#8) in Medina which should be theoretically another easy game. Al Salam will play on the road against Al Hilal in Riyadh and it may be a tough game between close rivals. In the last game of round 13 Al Wehda was defeated by Al Ittihad in Jeddah 64-60. There was no surprise in Jeddah where 7th ranked Al Wehda (4-9) was defeated by fifth ranked Al Ittihad (8-5) 64-60. The victory was the third consecutive win for Al Ittihad. They moved-up to third place, which they share with Al Ahli Jeddah and Al Nasr. Al Wehda at the other side keeps the seventh position with nine games lost. Al Ittihad's next round opponent will be league's second-placed Uhud in Medina and it will be for sure the game of the week. Al Wehda will play at home against Al Nasr (#4) and hope to win that game.